The Acorn Woodpecker (Melanerpes formicivorus) residency in Baba's Tree has much expanded! 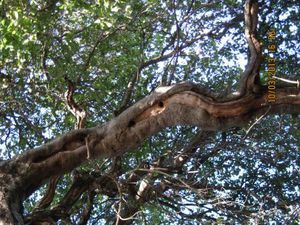 As of October 2013 there are four to five full-size nest holes, plus some tentative ones, all along the underside of one branch. Hopefully, they were used this past spring, 2014, for several broods. In February 2013 I saw just one nest-hole there. It is possible that I just never noticed others, but I'm sure I would have looked for more after spotting one. 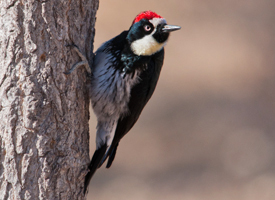 The cartoonist Walter Lantz is believed to have patterned the laughing call of his cartoon character Woody Woodpecker on that of the Acorn Woodpecker, while patterning his appearance on that of the Pileated Woodpecker (Dryocopus pileatus) which has a prominent crest. In some parts of their range (e.g., California), the Woodpeckers create granaries or “acorn trees” by drilling holes in dead trees, dead branches, telephone poles, and wooden buildings. The woodpeckers then collect acorns and find or make a hole that is just the right size for the acorn. As acorns dry out, they are moved to smaller holes. Granary maintenance requires a significant amount of the bird's time. You can find several such acorn-holes the woodpeckers have made in Baba's Tree. Also in the tall utility pole near the tractor shed. The holes have been emptied of acorns by now, August 2014, but expect them to be filled again as acorns ripen in late summer and fall. 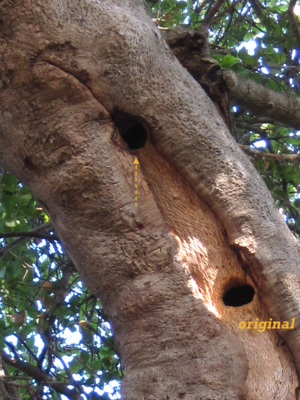 The following photos show Woodpecker nests in Baba's Tree photographed by Eric Turk in October 2013. The Woodpeckers are stock photos. "Baba's Tree on Baba's Birthday"